Enigmatic, evocative, and often simply strange, fraternal references are a rich part of contemporary American popular culture. 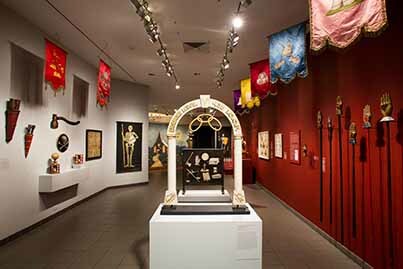 But the seductive mystique of secret societies, with their cryptic signs, gestures, and arcane rituals, has been inculcated in our American experience since the early eighteenth century. 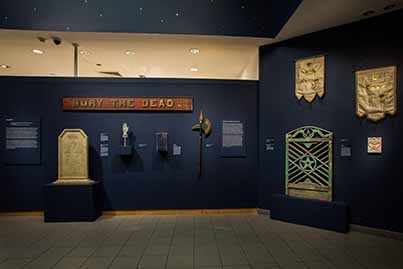 Before the age of mass production, the artist who painted a portrait or embellished a piece of furniture might have also decorated a parade banner, an apron, symbols on a chart, or a backdrop for a fraternal lodge. More important, he or she encoded the ideals of fellowship, labor, charity, passage, and wisdom—the core of fraternal teachings—into the many forms associated with fraternal practice. 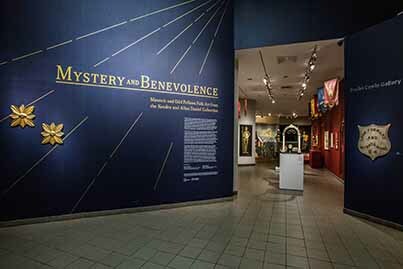 The iconic art and objects showcased in Mystery and Benevolence relate the tenets of fraternal belief through a potent combination of highly charged imagery, form, and meaning. 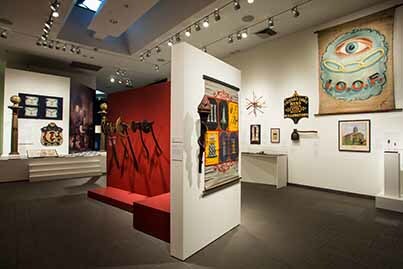 The exhibition explores the fascinating visual landscape of fraternal culture through almost two hundred works of art comprising a major gift to the American Folk Art Museum from Kendra and Allan Daniel. 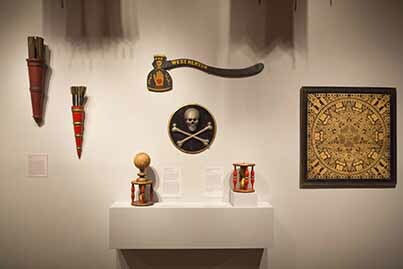 Co-curators: Stacy C. Hollander, Deputy Director for Curatorial Affairs, Chief Curator, and Director of Exhibitions, American Folk Art Museum, and Aimee E. Newell, Director of Collections, Scottish Rite Masonic Museum & Library. 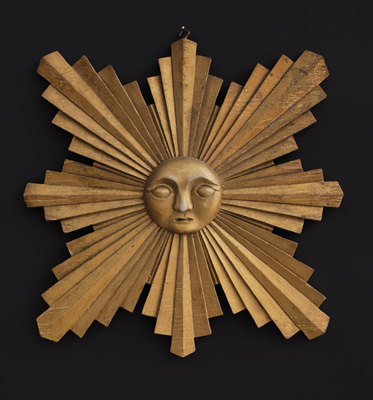 An exhibition catalog is available. 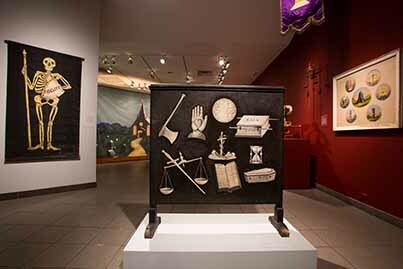 Image credits (from left): Masonic Sign, attributed to David Morrill (1788–1878), probably Vermont, 1871, paint and gold leaf on wood, 34 1/4 x 28 x 1 3/4 in., American Folk Art Museum, gift of Kendra and Allen Daniel, 2015.1.30. Photo by José Andrés Ramírez. 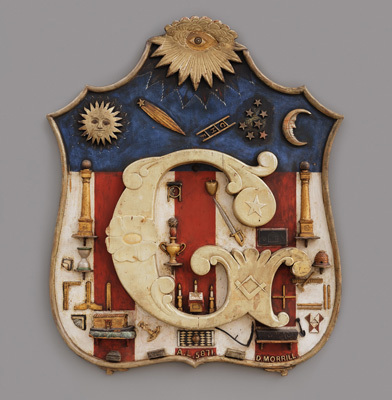 Independent Order of Odd Fellows Plaque, artist unidentified, United States, 1850–1900, paint and gold leaf on wood, 16 x 15 x 1 1/2 in., American Folk Art Museum, gift of Kendra and Allan Daniel, 2015.1.19. Photo by José Andrés Ramírez. 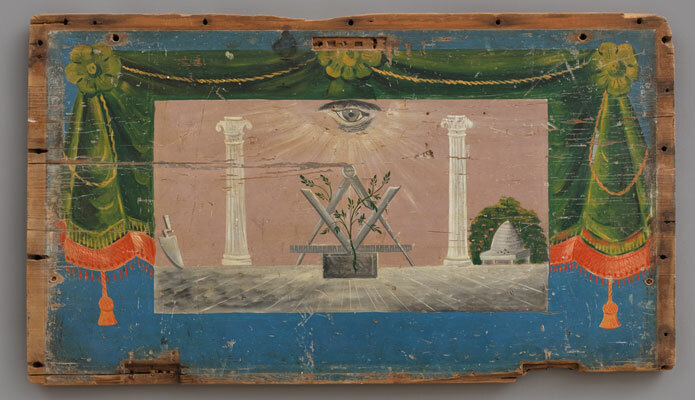 Chest Lid with Masonic Painting, artist unidentified, probably New England, 1825–1845, paint on pine, 22 1/4 x 37 1/4 x 2 5/8 in., American Folk Art Museum, gift of Kendra and Allan Daniel, 2015.1.28. Photo by José Andrés Ramírez. 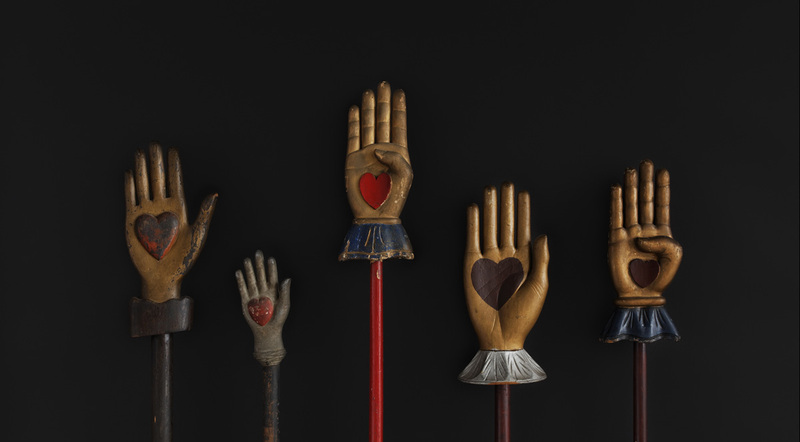 Independent Order of Odd Fellows Hand Staffs, artists unidentified, United States, 1850–1900, paint on metal and wood; paint and gold leaf on wood, various dimensions, American Folk Art Museum, gift of Kendra and Allen Daniel, 2015.1.135, 136, 137, 138, 139. Photo by José Andrés Ramírez. 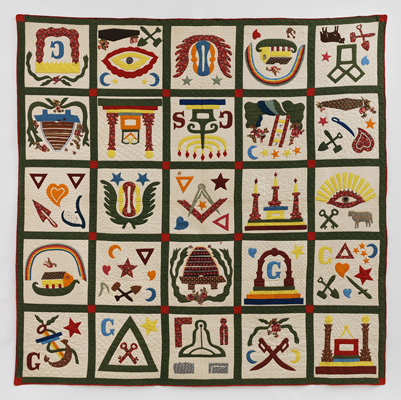 Masonic Appliqué Quilt, artist unidentified (grandmother of Wayne Robb), United States, 1885, cotton, 86 x 88 1/2 in., American Folk Art Museum, promised gift of Kendra and Allan Daniel, P.2015.2. 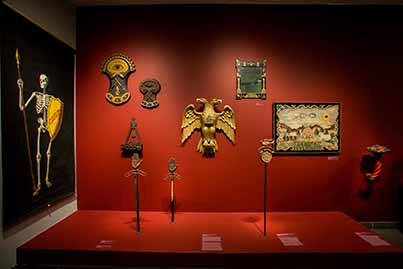 Photo by José Andrés Ramírez. 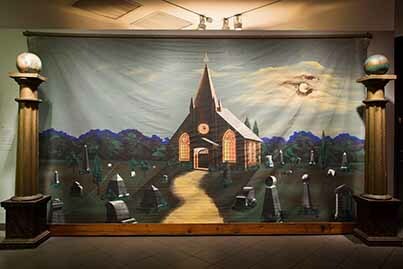 Installation photos by Olya Vysotskaya. 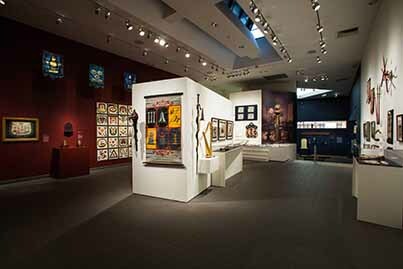 The exhibition is supported in part by Joyce Berger Cowin, Kendra and Allan Daniel, the David Davies and Jack Weeden Fund for Exhibitions, the Ford Foundation, the Leir Charitable Foundations, public funds from the New York City Department of Cultural Affairs in partnership with the City Council, and the New York State Council on the Arts with the support of Governor Andrew Cuomo and the New York State Legislature.